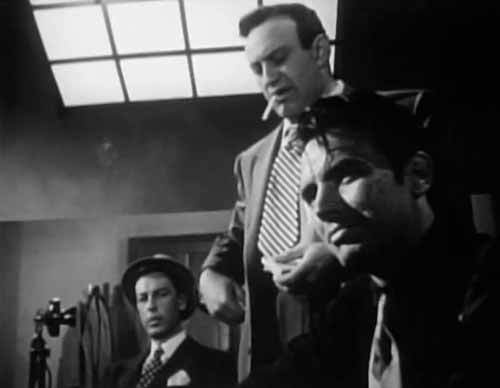 Crooked cop Lee J. Cobb (standing) grills a man for a murder he himself is involved in. Do you ever wish you could make studios re-do certain movies? Well, we certainly do! We just watched a film noir that left us feeling so dissatisfied, we’re placing a call to Warner Brothers. The movie is 1950’s The Man Who Cheated Himself, but it would be more appropriately titled, The Movie that Ripped You Off. Before we launch into our tirade, it’s only fair to give you a brief rundown of the plot and, as far as plots go, it’s pretty juicy. A San Francisco police detective arrives at his married mistress’ house just as she shoots and kills her husband. Instead of arresting her, the detective loads the husband’s body into his car and dumps it. But here’s the thing: the detective’s kid brother, who is also on the police force, is assigned, along with the detective, to investigate the murder. Get this: The kid brother so keen to solve the murder, he delays his honeymoon to focus on the case. There is a fabulous cast attached to this film. Lee J. Cobb is the seasoned, crusty detective who expects the worst of people. His dialogue is sparse and packed with meaning; nothing is wasted. For example, after his mistress shoots her husband and asks if they should call a doctor, Cobb replies, “Two slugs in the chest.” The way he says it, you know the man is dead. John Dall is Cobb’s idealistic younger brother who is a little too smart for Cobb’s comfort level. He idealizes Cobb, until the moment it dawns on him that Cobb might involved in the murder. And then we have Jane Wyatt, Cobb’s mistress, who is a perfect noir dame – beautiful, selfish and manipulative. Her charm appears as suddenly as it vanishes. So. How can this premise, paired with this cast, end up in such a mess? Now, Dear Reader, we are not a screenwriter and it’s very easy for us to criticize something we know little about. So our opinion is based on our belief that the scriptwriting team was capable of doing better. But maybe the scriptwriters aren’t to blame; perhaps there was too much studio interference. Here’s what we have: (A) A crooked cop tries to cover up his mistress’s crime; and (B) an adoring brother who is keen to solve this murder to please him. Instead of exploring this sibling relationship, the movie merely pays lip service to it. If you blinked, you would miss the scene where Dall realizes, with horror, that his brother is not who he claims to be. Whoa! That is one callous script. No, let’s not put our energies into philosophic possibilities. Here’s a better idea for the script! Let’s waste the final 20 minutes of the film in an empty, windy San Francisco fortress with no dialogue and no tension and no point! Let’s give Cobb and Wyatt the bright idea to hide in a corner of this fortress. Then let’s bring Dall, in frantic pursuit, and make him run around the fortress like an idiot, searching for these two. However, the film’s last scene is a redemption of sorts. Cobb, under police guard at the courthouse, spots Wyatt and her defence attorney walking through the corridor. Wyatt is fervently promising her lawyer that she will do Anything if he keeps her out of prison. Cobb overhears this conversation but, being the cynic he is, isn’t surprised or troubled by it. On the contrary, he gives her a look that says, It was worth it. We have to admit it’s a bit satisfying to see Cobb smug and unrepentant at the end – if only to make up for that dreary fortress scene. There. Let us never speak of this movie again. The Man Who Cheated Himself: Starring Lee J. Cobb, Jane Wyatt, John Dall. Directed by Felix E. Feist. Written by Seton I. Miller & Philip MacDonald. Warner Bros. Pictures, B&W, 1950, 81 mins. Ruth, your review was a scream. I’ve only seen this movie once, and I definitely don’t remember disliking it as much as you did — but I sure enjoyed your take on it! Ha! Thanks, Karen. I was SO disappointed in this film. I mean, Lee J. Cobb! John Dall! A crooked cop! What could be better? What does it say about me, as a movie fan, that I want to watch this film just to enjoy the awfulness. I fully believe that it is a bad movie and for some reason, that I just can’t understand, I want to experience it for myself. There might be something wrong with me. No, no, you should watch it and then review it. Being the type of blogger that you are, you will find lots of redeeming qualities which will make me like it better. I am sitting here LOLing at this review. I love it! Of course, I had to go look to see if this movie was included in my new San Francisco Noir book….it was, but the review is nowhere near as entertaining! Like the previous commenter, now that I’ve read your take on it, I want to see it too! This is great R.A. I loved reading this. I do have a case of the giggles now though, lol. Very much enjoyed your take. I quite liked it. Good to see Lee J Cobb in unusual role for him. And who would have expected Jane Wyatt in femme fatale mode. The acting in this film is very fabulous. And Jane Wyatt – I KNOW! She is a fantastic femme fatale. I have never heard of this movie, but I have to tell you, the thought of Jane Wyatt as a femme fatale is intriguing. I don’t think I’ve ever seen her play anything but a “good girl.” Lee J. Cobb is an amazing actor. I’m sure he turned in a super performance. It’s so frustrating when a film has a cast you love and you’re really looking forward to watching it, only to discover that it has let you down. That has happened to me on so many occasions. Yes, sometimes movies can be a Big Disappointment., as this one was. However, the acting is top-notch. Lee J. Cobb would steal the film if it weren’t for Jane Wyatt and John Dall. I like the movie better than you did. But I have a “thing” for classic ‘B’ films. I thought Lee J. Cobb and John Dall gave wonderful performances in this noir thriller. It is also nice to see a 20 year-old Lisa Howard, in a supporting role as Dall’s new wife. I also thought that Jane Wyatt gave a wonderful performance playing the femme fatale. You gave me such a laugh with this one! If only they had tried harder since it was a decent concept with potential. Thanks for dropping by, Page. I laughed at your “Way to phone in the title” = EXACTLY! I was a bit hard on this film but I think that if you come up with a great premise, you’ve gotta see it through. Audiences are owed that much. Oh my – I think your review is far superior to the film! Very funny and, sadly, so true. I hate when writers keep you enthralled and then plop a bad ending in your lap. Good endings are the hardest things to come up with. Thanks for a great post and a good laugh. I love your phrase “plop a bad ending in your lap” = perfect! A bad ending is SUCH a let-down, isn’t it? But a good ending that pleases everyone is a tough thing to write. How depressing! The plot sounds intriguing and I’m a big fan of both Cobb and Dall. Seton I. Miller was a respectable screenwriter (well, except for PETE’S DRAGON), so it’s a shame all-around. If it weren’t such a great premise, then we as an audience wouldn’t feel so let down. I didn’t realize Seton I. Miller wrote “Pete’s Dragon”. It really isn’t such a bad film… It does have a kind of charm, no? I wish! Oh well. You can’t hit it out of the ballpark every time, right? I know you’ve warned not to see it, but now I want to! It sounds a bit better than The Boy in the Plastic Bubble that I recently saw on a family vacation! Don’t do it! Run – save yourself! “The Boy in the Plastic Bubble” – is that a late 1970’s movie with John Travolta? Yes, made in 76 for an ABC Movie of the Week. 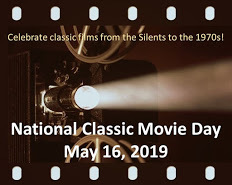 I found it on dvd at our local library, and since we would be vacationing with my husband’s sister, brother,and sister-in-law, all teens in the 1970s, I knew they’d remember this -ahem- gem! It became a great movie watching moment, with a lot of laughs on our part. Sorry I can’t abide by your request to never speak of this film again. I love John Dall enough to perhaps overlook the film’s weak points. Sounds like the film was running 20 min. short, so they needed to pad out the conclusion. John Dall really is a terrific actor and the filmmakers here should be penalized for not making better use of him.